Sonship Christian Fellowship is a community of believers that are pressing toward the mark of the high calling of God in Christ Jesus. Faith, Hope and Love are expressed in many ways to our community and those whom we meet. 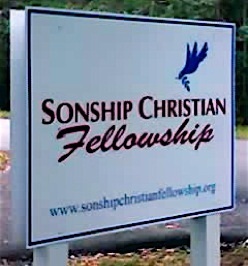 Sonship Christian Fellowship is an historic Christian church that believes that the Lord Jesus Christ is the only way, truth and life. Being transformed by the power of the Holy Spirit, we believe that we can be like Him. The Gospel of the Kingdom is “meat in due season” for the end-time church and our local body is committed to living and preaching this message. ‘Perfected in Love’ is the mark that we press into by our commitment to our Savior, the Lord Jesus Christ. The ‘Ascension gift ministries’ of Ephesians 4:11 are an essential part in equipping and training His Church for the “perfecting of the saints.” God’s servants are set in the body of Christ to adjust His people and prepare them for the “Army” that will defeat the forces of darkness.